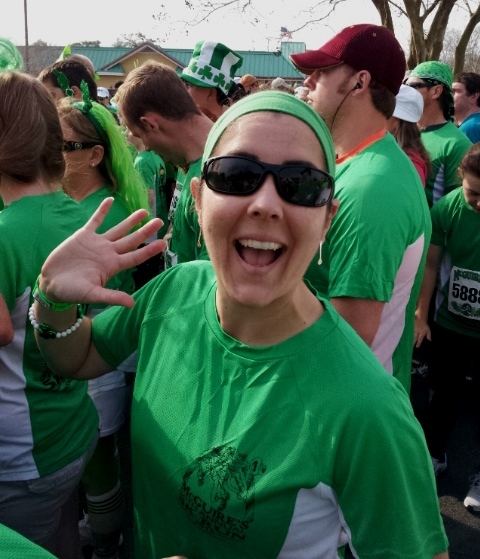 This morning I ran 3.1 miles with more than 16,000 green-clad friends. as a news crew took panoramic photos of the race. Billed as the nation's largest "prediction run," the McGuire's 36th Annual Prediction Run 5k did not disappoint. Race officials announced that 16,150 people registered for the McGuire's 5k. This beat 15,000 registrants and more than 10,000 finishers in at the race in 2012. After 3 years of running this race (first in 2011 and again in 2012) I have little new to report, other than noting that I'm always amazed at how smoothly the McGuire's folks manage to herd 16,000 runners through a bizarrely quick-and-painless bib pickup, a well coordinated (if a bit crowded) 3.1 mile run, and a raucous after-party. With 16,000 participants converging on a tiny parking lot behind a restaurant, you'd think bib pickup would be a nightmare, but McGuire's pre-race organization is virtually the antithesis of a big-name event. Think of the last Rock 'n' Roll expo you attended or read about. Compare that with a yoga class. That's about how different the two scenes are. Now, I mean no disrespect to the mega events that groups like Competitor and NYRR coordinate. There is an important place for those events in the running world. But with a similar numbers of competitors, it's hard not to make comparisons. McGuire's has no frills, but is incredibly efficient. You arrive at packet pickup. You get your bib and t-shirt. You can get a wrist-band if you want to enjoy after-party adult beverages. You go home. The entire process takes less time than ordering a latte at Starbucks. If you like the atmosphere of a race expo (and many runners do), you'll be disappointed by how little swag there is. If you run for the bling, this is definitely not your race. But if you prefer an event that is pared down to the basics: bib + t-shirt + run + party, you'll love this run. Also... if stunt runners make your day, this race is definitely for you. 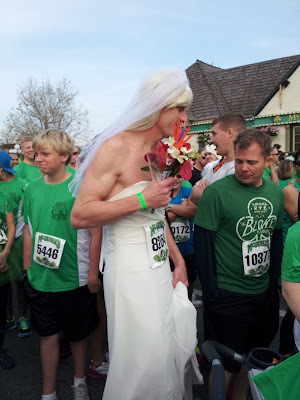 This year a man dressed as a "runaway bride" was my favorite costume-clad runner. The race also brought out 2 cows, 2 moose, a couple of bananas, and Bob Ross "Joy of Painting" his way through the 5k. Last year's Irish Mariachi band of runners was pretty cool, too. Click here for more photos from the 36th annual McGuire's Prediction Run 5k. Are you my next guest blogger?